The Access series represents three edited volumes published by the OpenNet Initiative and MIT Press that document nearly a decade of extensive technical and in-field research on the trends and patterns shaping information controls around the world. 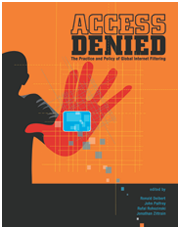 The practice and policy of global Internet filtering (2008) draws on results from the ONI’s first global survey of Internet censorship, documenting and analyzing Internet filtering practices in over three dozen countries. It stands as the first rigorously conducted study of state-based Internet censorship policies and practices. 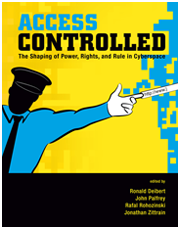 The shaping of power, rights, and rule in cyberspace (2010) updates and expands on Access Denied by presenting information controls that go beyond mere denial of information and aim to normalize (or even legalize) a climate of control. These next-generation techniques include strategically timed distributed denial-of-service (DDoS) attacks, targeted malware, surveillance at key points of the Internet’s infrastructure, take-down notices, and stringent terms-of-usage policies. Access Controlled investigates this spectrum of control in countries that make up the Organization for Security and Cooperation in Europe (OSCE) as it is there, primarily, where some of the most important techniques of information control are emerging and a normative terrain is being set. 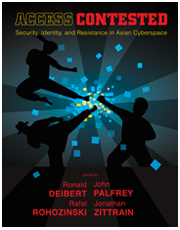 Security, identity, and resistance in Asian cyberspace (2011) examines the interplay of national security, social and ethnic identity, and resistance in Asian cyberspace, offering in-depth accounts of the unique national struggles against Internet controls in the region. The authors examine such topics as Internet censorship in Thailand, the Malaysian blogosphere, surveillance and censorship around gender and sexuality in Malaysia, Internet governance in China, corporate social responsibility and freedom of expression in South Korea and India, cyber attacks on independent Burmese media, and distributed-denial-of-service attacks and other digital control measures across Asia.